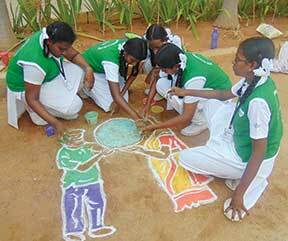 Design For Change (DFC) is a programme conceived by the Shree Niketan Group of Schools, Chennai, which addresses social issues. This year the students worked on a project titled “Saaindha Tharasu – Fighting Gender Imbalance” (Saaindha Tharasu in Tamil means Skewed Scale). The idea of taking up this social issue emerged when Chennai was witness to a broad daylight murder of a young engineering graduate. There were many who analyzed this issue in the media, but as an educational institution, we wished to do something that would be our contribution in joining hands with others to prevent atrocities against women. There are many stringent laws that aim to prevent these brutalities, but they still happen because more than prevention, it is the perspective that requires to be changed. So, the students began their study on gender imbalance by conducting a survey. The survey included about 1300 students in the age group between 12 and 16. After the survey, the students came up with some of the following inferences. Though 43% of the mothers are better qualified, only 39% are employed. 45.87% of the mothers devise the family budget, but only 33.23% have a major say in the financial decision. A meagre 12.9% of men help in the regular chores of the family, though 39% of the women contribute to the coffers of the family. Further, the group went on to address this issue by roping in several students to participate in various activities. A theme song titled Saaindha Tharasu was penned and composed entirely by some of the students – Marlin Priya, Nandhini, Uktha, and Pershiya. For a week, programmes were conducted, during which speeches, skits, mime shows and debates on “gender inequality” were presented. To ensure that younger children too were addressed, the DFC team came out with a comic book titled “The Funkis – A Stereotyped Indian Family” designed by the students. Ms. Sowmya Rajendran, Writer and Deputy Editor of The News Minute.Com and Ms. Pooja Vijay, a standup comedian released the book on Sept 10 in an orientation program held at the school campus. So far, the DFC team has visited five schools carrying forward the campaign against gender inequality to around 6000 students. Short sessions comprising speeches, skits, video screenings and distribution of the comic book was done during these school visits. 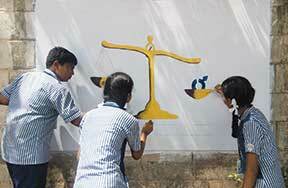 Other activities included street plays, self-defence programmes for girl students and painting sessions. A short film too has been uploaded on You Tube. The school has been engaged with this project for nearly a month. All these efforts are just a small step to try and change people’s mindsets about women and to bring about gender equality. Shree Niketan, Thiruvallur, Chennai, conceived in 2006, is committed to providing the highest educational standards to children. There are around 5000 students in the school who come from all walks of life. The school’s motto, “Indian Roots, Global Outlook” enunciates the school’s vision of imparting education of global standards while retaining the best of Indian ethos and values. The author teaches English at Shree Niketan Matric Higher Secondary school, Thiruvallur. She can be reached at hrsec_snms@shreeniketanschools.org.